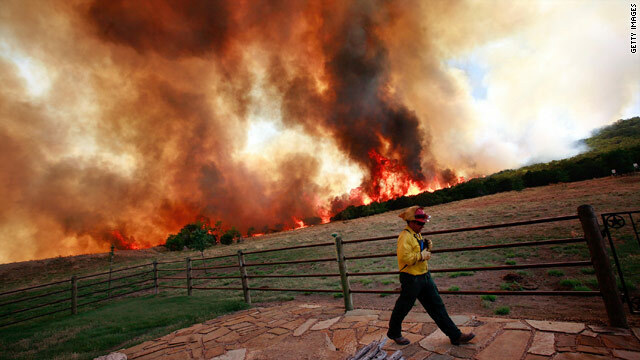 Crews battle a wildfire threatning a home in Strawn, Texas, earlier this week. Austin, Texas (CNN) - Texas’ water problems seem to have reached almost biblical proportions with a record drought, statewide wildfires and shrinking aquifers plaguing the Lone Star State. Praying for rain is not a new phenomenon. Religions the world over have sent prayers for precipitation to their respective gods. But does praying for rain work? In 2007, after a drier-than-usual summer, Georgia Gov. Sonny Perdue successfully prayed for rain. While Georgia did get some relief from its record drought, unfortunately there wasn’t enough of a deluge to stave off water rationing and restrictions. At least not that year anyway -– December 2009 saw record rainfall totals across the state, prompting some less-religious constituents to question the length of time it took God to answer their governor’s prayers. This weekend in Texas, some parts are expected to remain dry and windy, but cooler temperatures and higher humidity in others parts are giving emergency crews some relief. CNN meteorologist Sean Morris said thunderstorms are expected in the region this weekend, but they may not be of much help –- rainfall is expected to be low, and the lightning could spark further wildfires. Time will tell if the prayers of Gov. Perry and the people of Texas will be answered. Hiya, I'm really glad I've found this info. Nowadays bloggers publish just about gossips and web and this is actually irritating. A good web site with interesting content, this is what I need. Thank you for keeping this web site, I'll be visiting it. Do you do newsletters? Can not find it. Are people from Texas actually cave men and cave women dressed up like modern people? Brimstone can't be far behind..